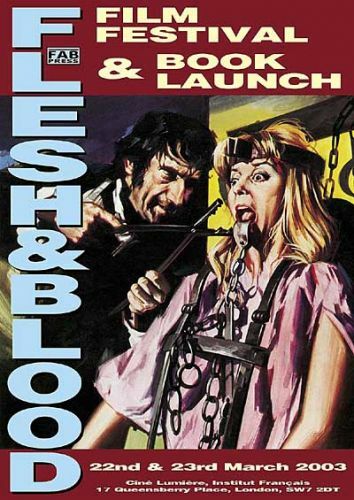 To celebrate the tenth anniversary of FAB Press, and the launch of the Flesh & Blood Compendium Book, FAB Press held a two-day film festival on the weekend of 22-23 March 2003. The film festival programme is an informative publication in its own right, and is still available to buy at a bargain price. Contents include full reviews for all the films shown at the festival, which are as follows: Blood on Satan's Claw, Chambre Jaune, Cutting Moments, Daughters of Darkness, Dust Devil, Flat-N-Fluffy, Four Flies on Grey Velvet, Insanity, The Manitou, Mark of the Devil, The Next Big Thing and Sleepwalker.